It’s been a busy few months for the Functional Grains Centre. 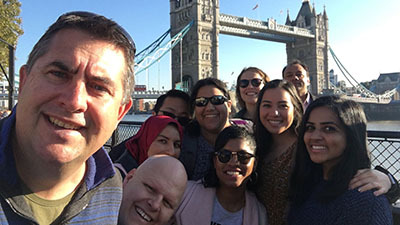 Many of the FGC crew had the opportunity to attend the AACCi Conference in London. All those presenting did an excellent job and the team projected a very professional image of the centre during the Conference. There were many connections made and new knowledge gained. The associated trips to Oxford and Rothamstead research institute provided the students with an insight into other outstanding research centres. We were delighted to see our first two ARC funded students walk across the graduation stage. 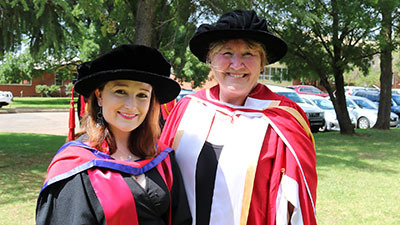 Dr Kyah Hester and Dr Rebecca Heim both received their PhDs at the December graduations and have now moved on to exciting opportunities. We also farewelled Robert Taylor, one of our research fellows who completed his work on measuring uptake of omega-3 fatty acids from animal feed rations. Congratulations to Neeta Karve who has submitted her thesis. Neeta has secured a position in the food industry and is enjoying her new role. We have also farewelled two of our researchers, Dr Asgar Farhanaky and Dr Mahsa Majzoobi. Asgar and Mahsa have relocated to Melbourne where they are pursuing opportunities at RMIT. However, they will both remain connected to the FGC through supervision of students. After many weeks of hard work we submitted an application to Australian Research Council (ARC) to fund a new Centre. We were pleased to welcome some new partners to this application and have managed to engage with stakeholders across the whole grain innovation chain including two international partners. Partners in our new bid include AgriFutures Australia, Australian Grain Technologies (AGT) Breeding, COFCO, CSIRO, FarmLink Research, Manildra Group, Moulamein Foods, NSW Department of Primary Industries, SunRice, The Product Makers, Voyager Craft Malt, QualySense and Tianjin University of Science and Technology. Let’s keep our fingers crossed for a positive outcome. All the best for a productive 2019! 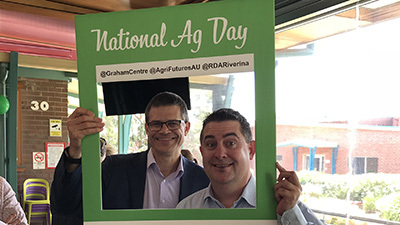 Photo caption: CSU Vice-Chancellor Professor Andrew Vann and FGC Director Professor Chris Blancahrd celebrate National Agriculture Day in 2018. 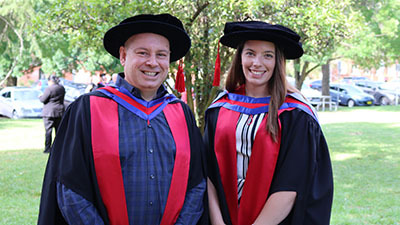 The Functional Grains Centre has celebrated the acheivements of two graduates, Dr Kyah Hester and Dr Rebecca Heim, awarded the PhDs By Charles Sturt University in December 2018. Dr Hester’s PhD titled ‘Gluten avoidance – trendy food fad, or insight into complex psycho-physiological interactions?’ helps to identify the drivers of non-prescribed gluten avoidance. “Up to 20 per cent of the population is estimated to take part in gluten avoidance behaviours, far exceeding the number of people with gluten-related disorders such as coeliac disease,” Dr Hester said. “This research is the first to establish clear and distinct symptomology relating to non-gluten foods, indicating that this population is more accurately characterised by their response to all foods, not just gluten alone. Dr Hester was awarded a scholarship by the Functional Grains Centre. Funded by the Australian Government through the ARC Industrial Transformation Training Centres scheme, the FGC is administered by CSU and is an initiative of the Graham Centre for Agricultural Innovation. Dr Rebecca Heim’s PhD research has shown refining oil-extraction techniques could improve the quality of Australian oilseed meals used as a supplement in feed for livestock. Dr Heim’s research investigated the nutritional and digestibility characteristics of canola meal for livestock. “The PhD included a benchmark quantitative survey of general and digestibility characteristics of protein for ruminants in Australian produced oilseed such as canola, soybean, cottonseed, and flaxseed meals,” Dr Heim said. Dr Heim hopes that the information can be used by meal producers and end-users to enhance feed ration formulations and provide better indications of animal performance. “The studies also highlight opportunities to improve the quality of Australian oilseed meals by refining oil-extraction technique conditions,” Dr Heim said. Dr Heim’s research was funded by the Australian Government through the ARC Industrial Transformation Training Centres scheme and was supported by industry partner MSM Milling. Dr Heim was based at CSIRO in Werribee, Victoria. 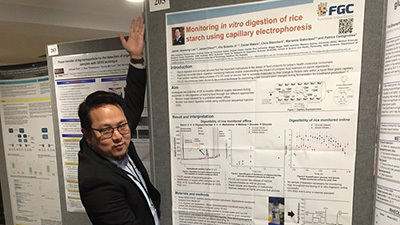 Functional Grains Centre research was presented at the AACC International conference, Cereals and Grains 18, held in London. AACC International is a not-for-profit organization dedicated to advancing the knowledge and understanding of cereal grain science through research leadership, education, superior technical service, and advocacy. Some of the FGC students attending share their experiences. The Cereals and Grains 18 conference provided a perspective on grain science beyond the Australasian region. By viewing these presentations and engaging in discussions with others at the conference I have been exposed to a wide range of trends in grain science and product development applications within the food industry and market. Presenting my poster allowed me to share my research and network with those who were interested in my project. I found the tour to Rothamstead research facility for long-term agricultural experiments fascinating. The four-day day conference consisted of several noteworthy speakers, symposiums, discussion sessions and oral presentations along with the chance to view hundreds of technical posters and to connect with others who share similar interests. I was able to network, meet new people who work in the same field, gain more knowledge on the projects to which I am currently assigned and learn more about the latest technologies and developments. It was a great opportunity to get feedback and suggestions via further interactions between peers and to develop future research collaborations. Presenting my work on an international platform enabled me to make contacts with other laboratories that may have future work or collaborations. Furthermore, I was able to liaise with other post-graduate students and find out more about the work they are currently undertaking. A common theme at most of the presentations was that human health studies are needed in order to fully demonstrate the potential health benefits of particular cereals, grains or cereal-based products. I also attended forum discussions based on health and it was clear that early-career researchers are needed to help bridge the gap between current research leaders and the direction we should be heading in terms of research and industry development. Researchers at the Functional Grains Centre (FGC) are investigating the antioxidant and anti-inflammatory potential of coloured rice. Inflammation and free radical damage has been correlated with the development of major lifestyle diseases such as type II diabetes and heart disease. Coloured rice is rich in bioactive compounds known as polyphenols. In-vitro cell culture studies conducted at the FGC have shown that these bioactive polyphenols reduce biomarkers associated with inflammation and free radical damage. Researchers at the FGC are now conducting a study to see if these bioactive polyphenols could have the same effect in people. 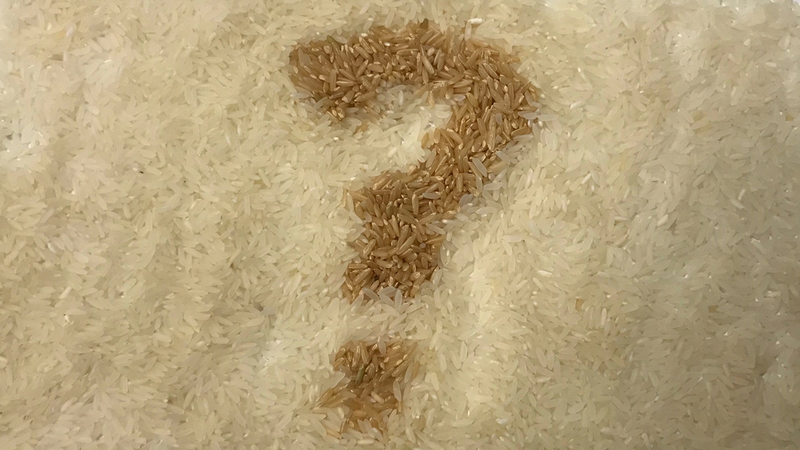 As part of this research the team needs volunteers aged between 18-65 who are non-smokers and are within a healthy weight range to consume coloured rice and donate small blood samples after eating the rice. The research will be conducted in Wagga Wagga in February 2019. If you are interested or would like more information please click here or contact Esther on 0457414220 or ecallcott@csu.edu.au. 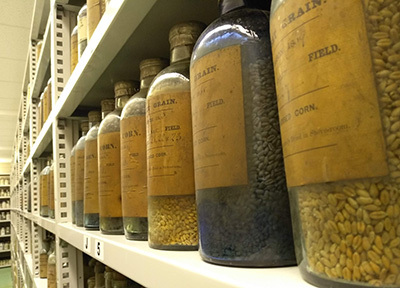 Associate Professor Dan Waters writes that the Functional Grains Centre has hosted two students keen to tap into the research expertise at the Centre. PhD student Erick Morales Polanco from Santiago de Querétaro, Mexico spent the last six months of 2018 at the FGC. Erick’s PhD research is examining the inclusion of pea protein in oat crackers (biscuits) as a functional food. Following a scan of the worldwide literature on the topic, Erick concluded the FGC was the place to go to engage in some research which would put the metaphorical icing on the cake of his PhD. The icing in Erick’s case was to subject the pea protein concentrate he has been researching to in vitro digestion, then use mass spectrometry to characterise the released peptides. Erick’s background highlights how science offers great opportunities and experiences in working on a diverse range of interesting projects. 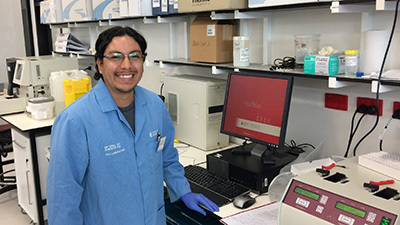 Although Erick is undertaking his PhD in food chemistry/technology, he has an undergraduate degree in chemical engineering majoring in process engineering. Erick extended his undergraduate work to a Master of Science where he used his skills in software engineering to control the crystallisation of honey. He has also worked in a coffee processing factory looking after the processing, quality control and flavour profiles. This work inspired an interest in food chemistry and before long Erick found himself feeding crackers containing pea protein to mice to see how well they grew and how biochemical health markers responded to this diet. Erick has completed data gathering parts of his research and has now moved the writing up phase. We wish Erick well for the submission and defence of his PhD which should take place in mid-2019. The FGC also hosted University of New England (UNE) Bachelor of Agriculture student Erin Lukey for the month of November. Erin spent her early years in the Sydney suburb of Turramurra and it was during this time she developed an interest in agriculture, sparked by visits to her neighbour’s hobby farm near Orange. Erin is interested in all elements of agriculture, from very practical on-farm activities to business principles, and the science which drives productivity and profitability. As part of the UNE Bachelor of Agriculture requirement to complete practical work, Erin has previously spent time on farms with stock and station agents engaging in the production and business side of agriculture. Given her interest in the science behind agricultural production Erin found her time in the Charles Sturt University (CSU) labs working with FGC students Esther Callcott, Shiwangni Rao and Michelle Toutounji on their rice projects a rewarding experience. Getting your blood pressure and weight checked isn’t usual practise at morning tea but on Friday 12 October Functional Grains Centre researchers put the spotlight on health to mark World Thrombosis Day. CSU lecturer in haematology Dr Abishek Santhakumar said, "Thrombosis is the formation of potentially deadly blood clots in the artery or vein and the condition is one of the leading causes of death worldwide. Improving human health is one of the areas of research at the FGC and Charles Sturt University School of Biomedical Sciences. Check out the highlights in this short video.